Shyam Thapa (Diploma in Development Leadership, 2018) is the Programme Analyst, Gender for United Nations Population Fund (UNFPA), Nepal. “UNFPA is the United Nations’ sexual and reproductive health agency. Our mission is to deliver a world where every pregnancy is wanted, every childbirth is safe, and every young person’s potential is fulfilled,” says Shyam. In 2018, Shyam was one of 41 participants from 19 countries to complete the intensive five-month Diploma in Development Leadership at the St. Francis Xavier University campus. 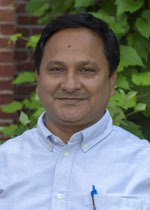 As Shyam returns to Nepal, he reflects on his experience at Coady.